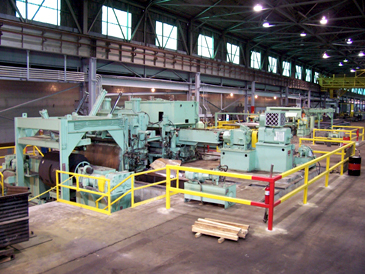 Gadsden, AL - Jemison Demsey Metals has installed a massive wide gauge range cut-to-length line at its Gadsden, AL, facility. 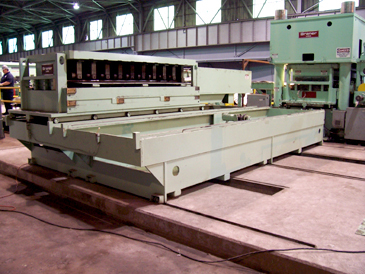 The CTK line, manufactured by Braner/Loopco, Schiller Park, IL, has the capacity to convert 80,000# x 84" OD hot rolled steel coils into panel flat sheets and plates in gauges from .050" to 1/2" thick in widths from 24" through 100". Material yield strength capacity ranges from 36,000 PSI to 70,000 PSI. A Cassette Leveler with two exchangeable Cassettes and a Servo Roll Feed gives the CTL Line the unique ability to efficiently process coils throughout a wide range of gauge yield strengths. Entry Section: Master coils are staged on Entry Coil Saddles from which a Pit Coil Car transports and loads IDs from 20" through 33". The Cone Uncoilers are equiopped with 2-100 HP DC motors (one on each housing) that provide feed-up and back-tension power. 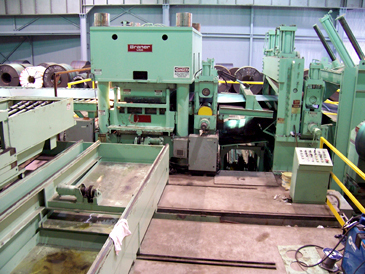 A Hold-Down Roll and a Hydraulic Set Breaker Roll are mounted above the Uncoiler in a common floor frame, and both are employed to thread coils into Pinch Rolls and an Entry Crop Shear. 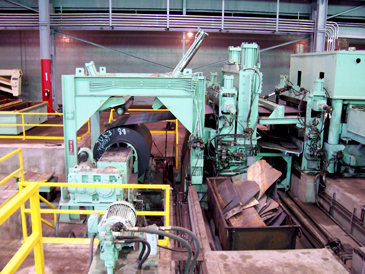 The coil head end is sheared-off with the scrap ends collected in a Powered Scrap Car. The Scrap Car delivers the scrap pieces to a collection box where the scrap is power unloaded. The Pinch Rolls are mounted in close proximity to the shear in order to feed the coil ID tail into the Shear for shearing into short pieces. 3.000" Cassette Stored on the Injector Cart. 5.500" Cassette is installed in the Leveler. Cassette Leveler: At the heart of the CTL Line is a massive 4-post Hydraulic Cassette Leveler that processes a gauge range from .050" through 1/2" via two exchangeable Cassettes. Gauges from .050" through .250" are processed on a 3.000" x 17-Roll x 9-Flight x 4-Hi Cassette. The Cassettes are powered by a 500 HP Leveler drive. The small Cassette operates at 0-250 FPM, while the large Cassette operates at 0-160 FPM. The Cassettes are stored on a Cassette Injector Cart that shifts from side-to-side to align each Cassette with the Leveler frame. Cassettes are power injected into the Leveler frame in 2-minutes. Hydraulic locks secure the Cassette in the Leveler frame when running. Work roll, back-up roll, and universal shaft maintenance mill scale clean-up is easily accomplished with the Cassettes ouside the Leveler frame on the Injector Cart. Off-line Cassette maintenance gives Jemison Demsey the ability to operate the CTL Line with one Cassette while performing preventative maintenance on the other.